On Sunday, November 17th a tornado swept through Washington, IL, a town of 34,000 people destroying 400 homes and killing six people. 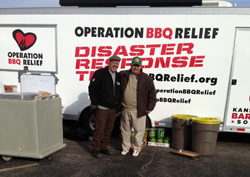 Early Monday morning, Illinois BBQ Alliance (IBBQA) made the decision to offer support to Stan Hayes of Operation Barbecue Relief (OBR) an organization IBBQA has supported since our inception. OBR was the impetus for galvanizing Illinois barbecue people to create the alliance. Dave Raymond, Ron Nunes, and Tim Hester prepared the Sweet Baby Ray competition team trailer, loading it with charcoal, propane, wood, cleaning supplies, serving utensils and food. Close to 1000 pounds of meat in the form of pork, brisket, burgers, Texas sausage and of course plenty of Sweet Baby Rays BBQ Sauce would be transported. Over 150 dozen hamburger and hot dog buns were donated and delivered to us by Gonnnella Bread and we waited for instructions on where to deploy. Barry Sorkin and Dave Raymond coordinated with OBR, the Sweet Baby Ray and True Cuisine kitchen staff to determine when we could deploy and we were ready to leave Monday. The decision was made to smoke our pork here and allow the authorities in Washington, IL to get organized. The next morning at 3:30a, Chef Duce and two cooks were working in the catering kitchen taking pork out of the smokers, pulling it and packing it all in warmers, we left by 5a and arrived in Washington at 8a. Our location was the Crossroads Church, an ideal location with a great team in place and the situation well under control. 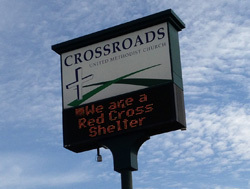 Crossroads Church was offering assistance to victims of the storm through insurance agents, nurses providing tetanus shots, and collecting donations of food and clothing. The arrival of the Illinois Barbecue Alliance was greatly appreciated as was the help and support of hundreds of local volunteers, the Salvation Army and Operation Barbecue Relief. We set up next to OBR and went right to work cooking pork sandwiches, hamburgers and hot dogs for lunch and again for dinner. On Wednesday morning at 6:00am we started cooking sausage for breakfast and right into preparing lunch and dinner for 500. After cooking we delivered food to the Police and Fire departments and other emergency outposts. It was during this time we observed the damage and the incredible amount of support vehicles and manpower working to restore normal life to Washington. Cold and exhausted we were treated to an evenings rest at a newly constructed assisted care facility that had no beds but heat and carpeting that made our evening rest much better than sleeping in the back of our vehicles. On Wednesday we were cooking by 6a with the help of some volunteers and by 10a we had cooked our food for the day and were ready to head home. Huge thank you to Nicky the Crossroads Kitchen Manager, OBR’s Dennis Truckenbrod and Stan Hayes, Phil Wingo, volunteers Tim and Collette and Chris Gruave and family from Lincoln. Duce, Bobby, Ron, Tim and the entire Sweet Baby Ray’s team that got everything together for us and dropping everything they had on their plates to make this possible for all of us. What I will never forget is the power and devastation of a tornado. Winds up to 196 MPH sound bad but unless you actually see what it can do, you cannot really know. 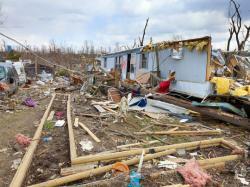 We saw volunteers and the devastation but we did not meet the victims of this storm. The ride down was full of anticipation and the ride home was full of humility and admiration for all the people who helped in any and every way. I witnessed how much we all need each other’s support. This was the part that makes me proud to be a member of IBBQA, and an American. God bless Washington Illinois and all of us.